We manage while you enjoy peace of mind. The next generation of investment management is here. Fiduciary. Fee-Only. Active and Proven. We recognize the importance of low-fees and how they should not affect the quality of your investments— which is why we adhere to a sound active strategy rather than passive and lazy. Stop worrying and start investing. Whether you’re an investor who follows the market daily or one who doesn’t follow it at all— Our rules-based, active management strategy will navigate you safely through the volatile market environment. 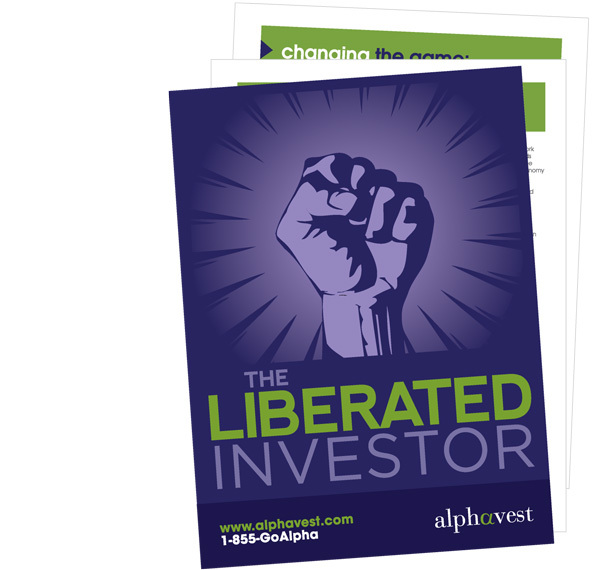 For individual investors, Alphavest offers a web-based investment management platform that blends the power of active investment stewardship with freedom, control and, of course, performance. Alphavest offers 401k plans that are actively managed so you can ride the upside and be protected during the downswings. Freedom, choice, and the power that comes from active investment management. For Advisors who focus on clients, Alphavest can help. For as little as .45 bp, we can manage assets through a rules-based, active management style that has consistently outperformed in good markets and in bad.